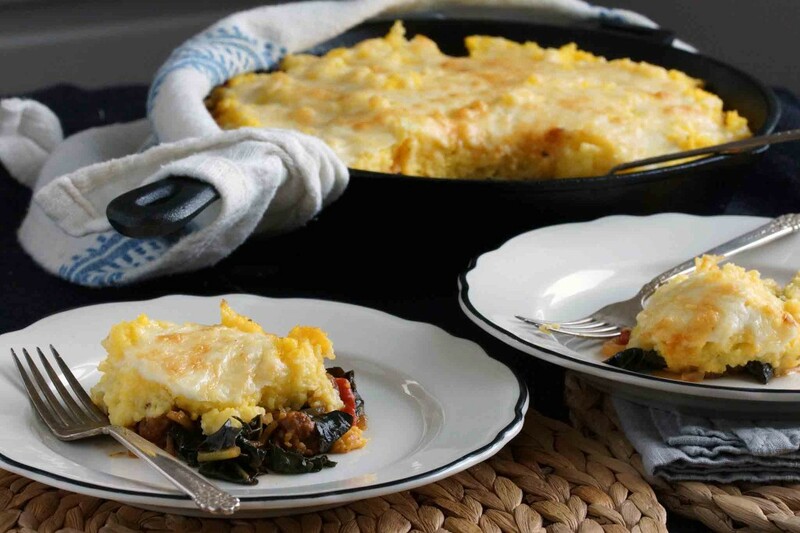 It’s an Italian take on a shepard’s pie. 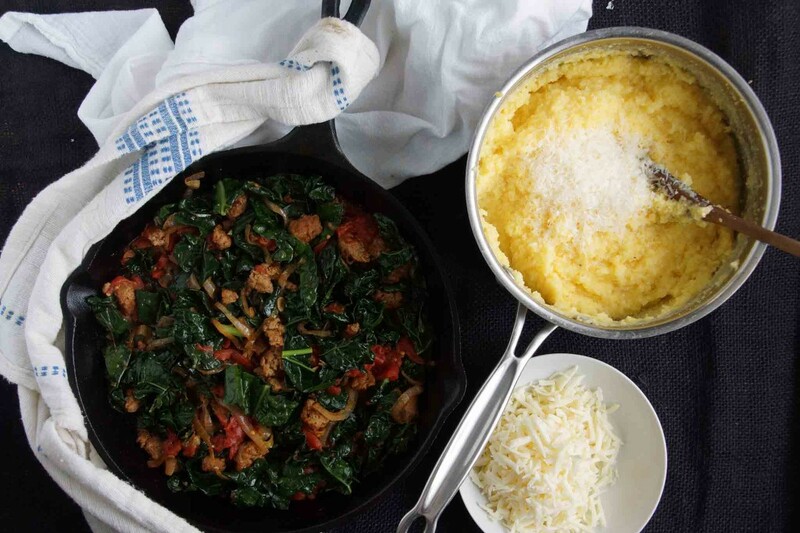 I made a saute of spicy sausage, kale, and tomatoes, topped it with a layer of polenta and a handful of grated cheese, and tossed it in the oven. The cheese bubbled and melted, the polenta got crispy-crunchy around the edges. It’s the kind of comfort food that’ll warm your heart, your soul, your stomach, and leave you barely even caring that you seem to be caught in the epicenter of that danged polar vortex. Ready? Let’s do dinner. Wait, dinner? Nah, this is supper, plain and simple. And really tasty. 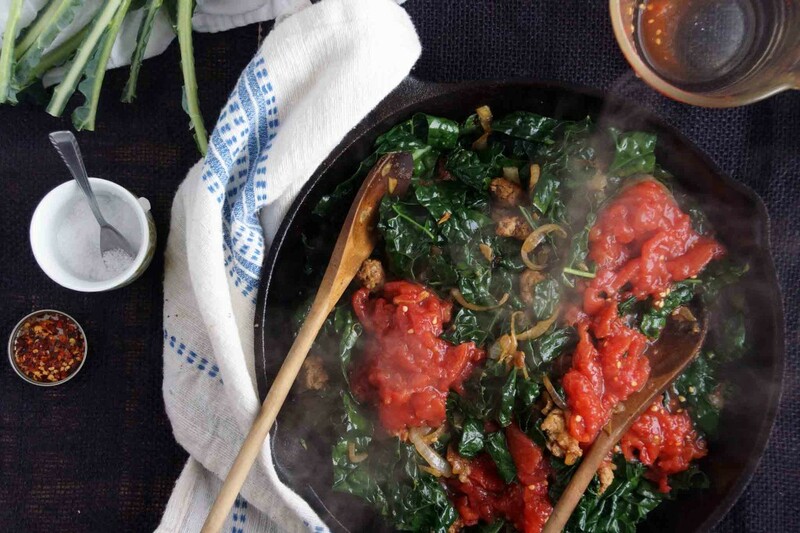 Gather up your ingredients: some polenta, cheese, a couple of spicy Italian sausages, a can of tomatoes, garlic, onion, and a big bouquet of greens. I used lacinato kale, which also goes by black kale or dinosaur kale, Tuscan kale or sometimes even cavolo nero (umm…I might have rattled off all of these options to the cashier as he hunted for the proper code), but any hearty, leafy green will do. 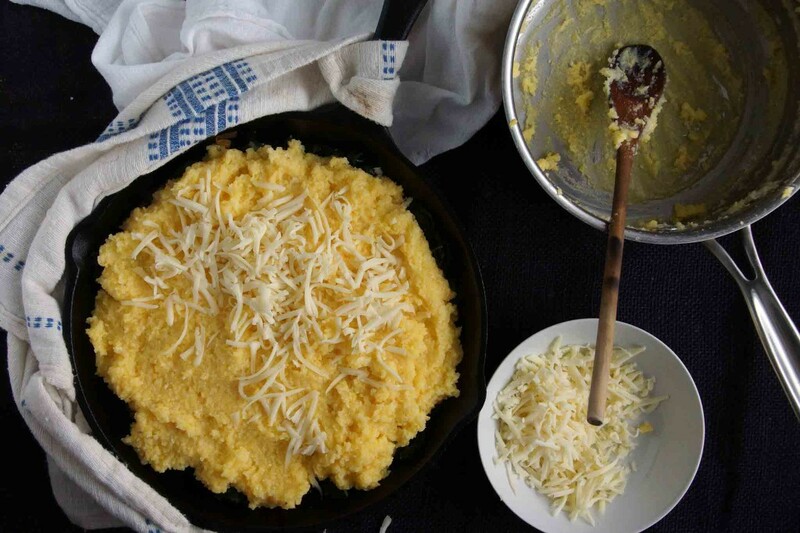 Get your polenta going first. 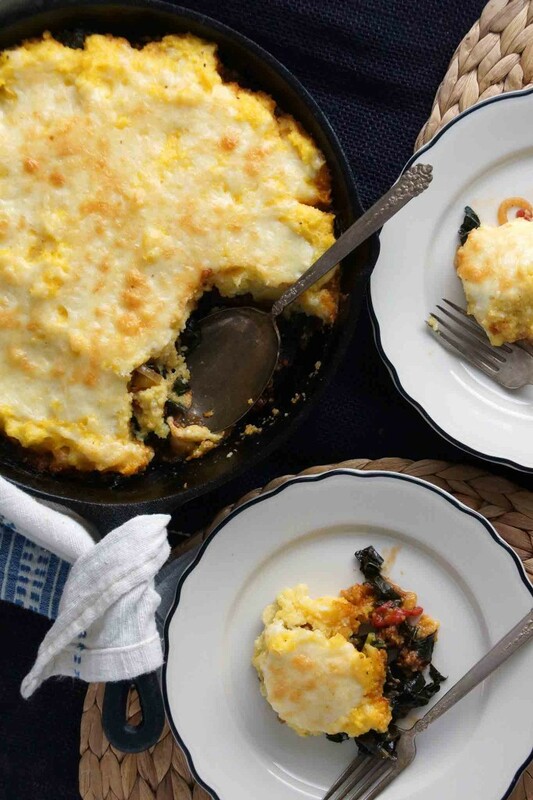 We’re shooting for basic, fairly firm polenta. Bring a pot of salted water to a boil, whisk in the cornmeal. Simmer, stirring every now and again until you’re happy with the consistency. If it starts to get too stiff, just add a little more water and stir it in. While your polenta is working, start prepping the rest of your ingredients. Slice an onion and a few cloves of garlic. Crush the tomatoes. Remove the tough kale stalks and give the leaves a chop. 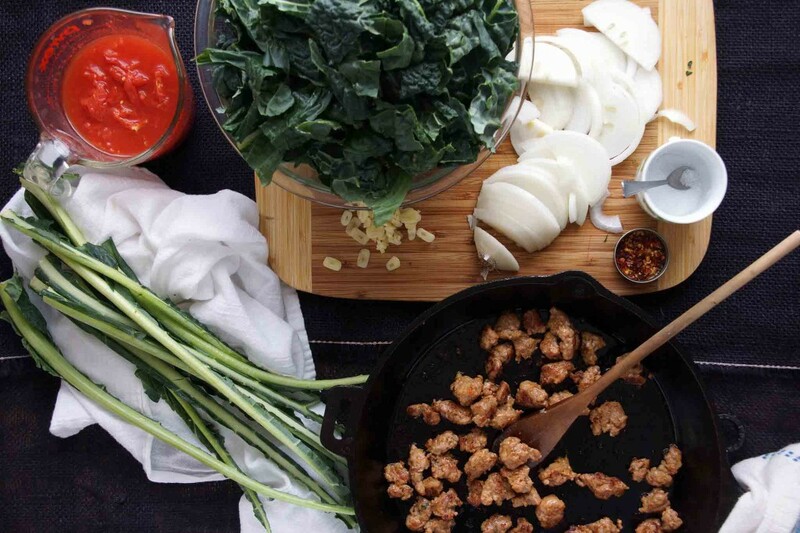 Pop the sausages out of their casings, break into bite-sized chunks, and brown the sausage in a large skillet. Add the sliced onion, garlic, and a pinch of red pepper to the pan and cook until the onions have wilted and the smell of garlic is filling your nostrils. Add the chopped kale to the mix in a few batches. 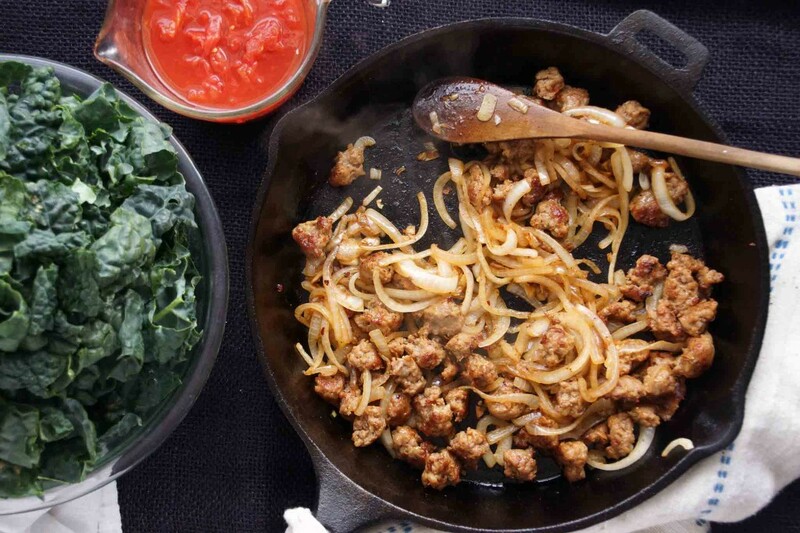 It’ll seem like the kale to sausage ratio is way off at first but as the greens cook down, the combination will even out. Once they’ve settled in to the pan, add the crushed tomatoes and simmer for a few minutes to let the flavors come together. Your polenta should be ready by now. Pull it off the stove and stir in a handful of grated parmesan. 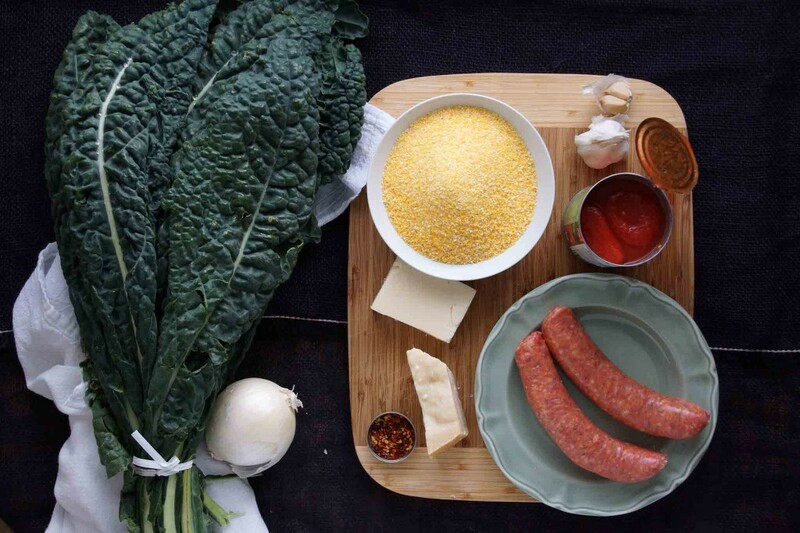 Spread the polenta over the sauteed kale and sausage. 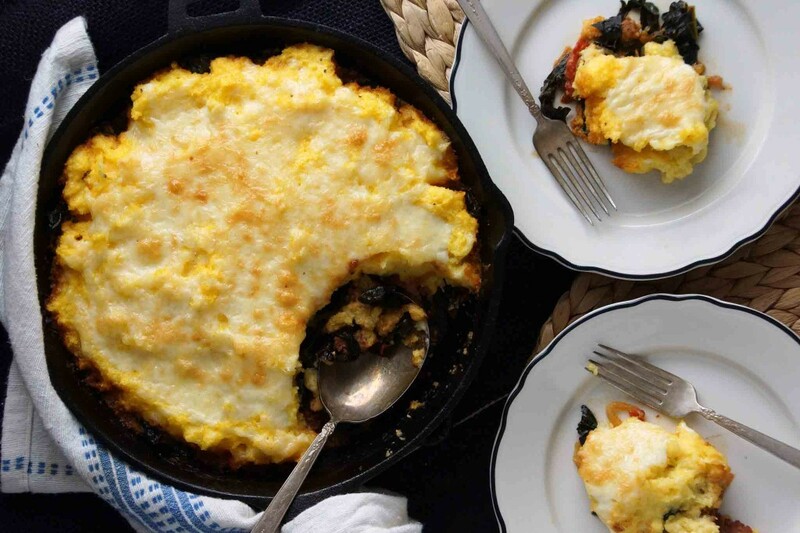 Scatter plenty of cheese over the top and pop it in a hot oven until the cheese is golden and bubbly, the polenta is crispy around the edges, and all is right in the world. And there we go–straight up winter comfort food, at its finest. Take that you silly old vortex, you. OHHHH does this ever look good! Something for everyone in it! 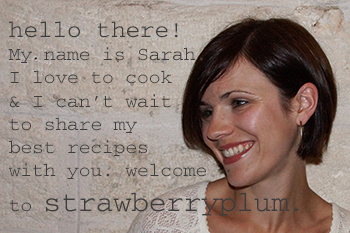 And I’m glad you’re cooking your way through this coldest of winters with a smile on your beautiful face!